Conjunctivitis is usually caused by a viral or bacterial infection, or by an allergy. It can also be caused by chemical irritation, or irritation from contact lenses. If your conjunctivitis is caused by a viral or bacterial infection it is called infective conjunctivitis. This often happens with a common cold or cough, especially in children. But sometimes it can happen without a cough or cold. Usually it is not serious and will clear up within a week or so without causing any permanent damage to the eye. However, sometimes it is more serious – for example if it is caused by the cold sore virus (herpes simplex), adenovirus or a sexually transmitted infection such as chlamydia. As the name suggests, infective conjunctivitis can spread easily from person to person, but it is not usually a serious health risk if diagnosed promptly. 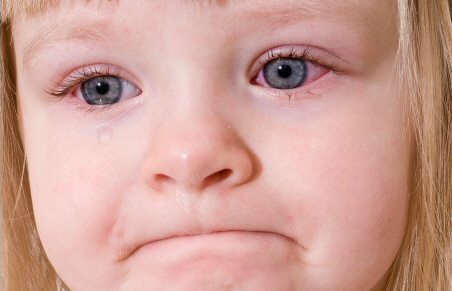 Conjunctivitis in newborn babies can be serious. If your baby has conjunctivitis take them to a doctor immediately. This happens at the same time each year. Mostly it is caused by pollen and happens in the hay fever season. If you have seasonal conjunctivitis your symptoms will last a few weeks or months every year, and be worse in some years and better in others, depending on the pollen count. You might also have other symptoms of hay fever, such as a runny nose and sneezing. This is allergic conjunctivitis you have all the time. It is usually caused by an allergy to house dust mites, which are tiny insect-like creatures that live in every house. They mainly live in bedrooms and mattresses. If you have perennial conjunctivitis you may also have perennial allergic rhinitis, which causes symptoms like sneezing and a runny nose. Your symptoms will tend to be worse each morning when you wake up. Contact with some animals can cause allergic conjunctivitis. Allergic conjunctivitis can be unpleasant, but complications are rare. Some people become sensitised to the chemicals in cosmetics, swimming pool water, or other substances their eyes come into contact with. This causes an allergic reaction like allergic conjunctivitis. The skin on their eyelids might also become inflamed. This isn't common, and we don't know exactly what causes it. It happens in some people who have a contact lens or other small object in their eye. It affects around 1% of contact lens wearers. It also sometimes happens after surgery. These two forms of conjunctivitis can occasionally cause inflammation and ulceration of the cornea, called keratitis. If they aren't treated they can cause some vision loss. On the next page: What are the symptoms of conjunctivitis?